Corral the mass of crumpled plastic bags left over from countless shopping trips with three tried-and-tested tricks. Have you ever felt overwhelmed by the sheer quantity of plastic shopping bags you’re harboring underneath your kitchen sink? Perhaps they’re devouring the pantry, instead. No matter the location or the number of bags, you’ll be happy to know there are ways to minimize clutter while they wait to be reused. Here, we took puffy piles of 15 bags each and condensed them for easy storage using our three favorite tricks. 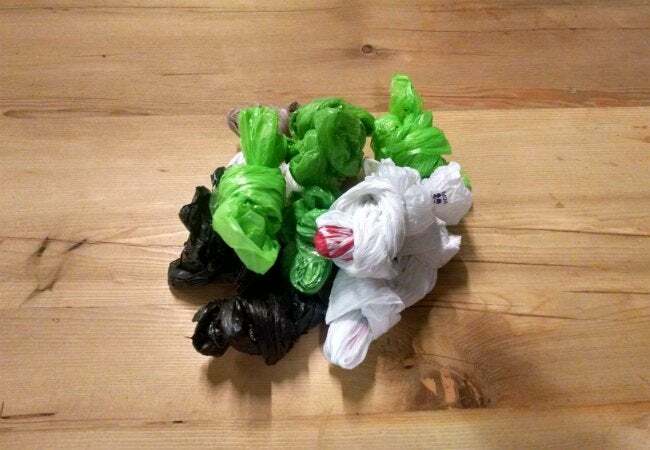 Try one of these methods to reduce your bags’ footprint in your own home, and your storage space won’t be overrun by plastic again. Short on time? This storage solution is a clear winner for the quickest way to stash your plastic bags. The method is simple: There is none! 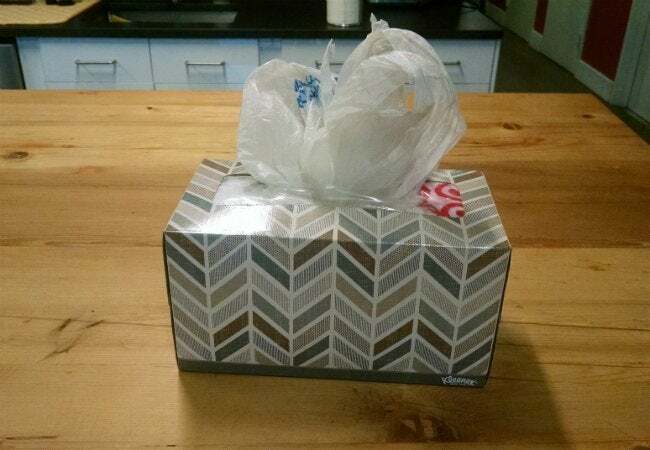 Just save the last tissue box you’ve emptied, then cram as many bags as you can into it through the plastic slit in its top. (We fit 15 in a box that once held 210 tissues.) The cardboard structure will keep your mess contained when you stick it back in your pantry. 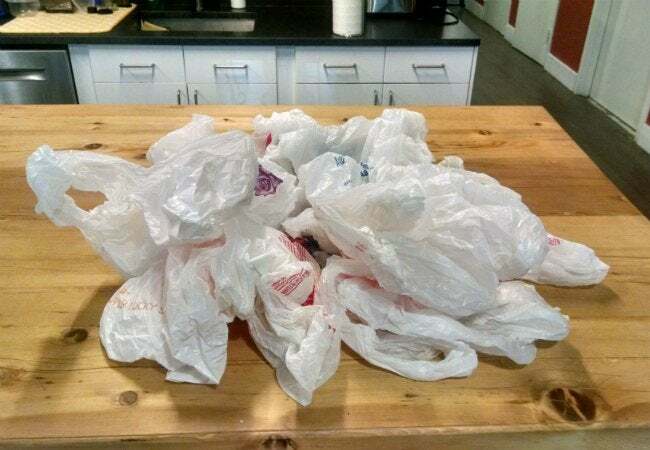 This next method also prevents the bags from overflowing, but this time by keeping each bag individually balled up. Hold the very bottom of a bag in your right hand, and pull the other end taut using your left. Then, bring the ends together so the bag is folded in half. Knot the six- to eight-inch length of folded bag, and toss it into a crate or bucket for use later. And finally, here’s a use for the skills you honed while passing notes in junior high—this organizational trick hinges on the football fold. First, flatten your plastic bag into a rectangular shape. Fold it in half lengthwise so that the sides meet, then fold in half again. Smooth your bag once more from the bottom to the handles in order to press out any air. Starting at the bottom, pull the left corner up and across so that the end is triangular, then fold the pointed corner (the right) up so that the bottom is squared off again. Now alternate: Pull the right corner up and across, and the left directly upward. Continue this triangular fold as far as you can, until you’re left with the handles. 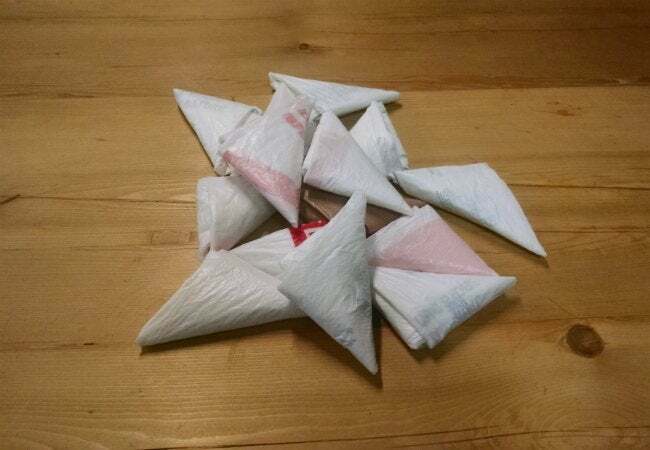 These you’ll tuck snugly under the top flap of the triangle you’ve just folded, and the thin folded triangle you’re left with can be stacked neatly in a basket until it’s ready for use. Check out pictures of the step-by-step at Instructables.